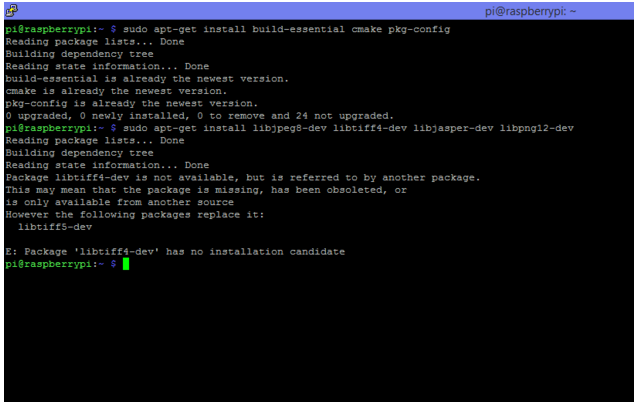 I am trying to install openCV 2.4.9 on raspberry pi 2 but facing some error regarding libtiff4-dev image format. I have tried with 'libtiff5-dev' also but it is not working. I dont know what the issue is, I installed same openCV in my other micro SD card 3-4 month before that time it worked fine. I have already install python 2.7.9. I have tried searching for this error but was not able to find a solution, can anyone help me? Tell me what wrong I am doing here. before attempting to install it. If this still does not work you may need to add the repository that libtiff4-dev comes from, but it could be that libtiff4-dev is no longer included in any repositories, in that case, you may be out of luck. I just did sudo apt-get update on my Pi and then sudo apt-get install libtiff4-dev and I was able to install it, so it is still in the repo. Not the answer you're looking for? Browse other questions tagged raspbian software-installation opencv or ask your own question.